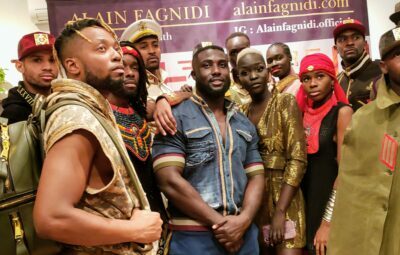 The Black Accessory Designers Alliance (BADA) gives African Americans and other minority designers the opportunity to promote and express their designs. During New York’s Fashion Week, co-Founders Velvet Lattimore and Wilbur Pack, Jr. hosted an impeccable pop-up soiree showcasing different designers and their collections. There were so many choices from hats to authentic jewelry, to dresses that brought every designer’s own flavor of fashion to the table. If you feel like a Queen and love big earrings The House of Kaluaah and The House of Royalty is a great choice. The big earrings are motivation to pick your head up when you’re down. These designs are never before seen and definitely worth having when trying to leave an impression. We may want to look like African royalty or just having a bad hair day, either way, that makes hair ties a necessity. Urban Turban has turbans in different designs, colors, and patterns. Urban Turban allows an individual to express themselves and heritage by just using a headscarf. Little Bamboo Dress is every woman’s dream, each dress has five pockets and comes in different colors. The dress can be worn in the office or on a chill day and is Japanese inspired. The designer’s goal is to embody positivity. The pursuit of love, happiness and positive energy all comes with a little bamboo dress. Everyone wants to look stylish even the young ones, Junior Baby Hatter provides cute looking hats for every kid. Father and son moments can be captured with matching vintage hats. Style has no age. Lisa McFadden could never find a hat that fit her hair, so she started making her own. All of her hats are handmade and of different styles and materials. Former Hollywood actor Andre Pierre started his own line of wine bags that are useful in many other ways. The wine bags come in different colors and can be used to put your remote or other personal items in. “Rococo Design interior” has created a pillow and blanket all in one referring to it as “Throw and tuck”. Also an interior design company the pillow and blanket are made sure to look good while comfortable. Pack and Lattimore started BADAUnite together while still having their individual brands. Lattimore previously made her own handbags and owns her own store in Brooklyn, NY, where all the accessories in the store are handmade. Pack has his own line of handbags promoting positivity with hashtags used on social media. BADA has kicked this season off using its platform to present several talented accessory designers as described as one of their five initiatives to creatives. We can look forward to panel discussions and network mixers, internships and mentoring programs, a physical store location and e-commerce pop-up events and a budding directory of accessory designers or color. Utilizing a platform for creatives is always commendable and we look forward to more! Thanks for highlighting our tiny caps for tiny chaps! It was a great event!